Butch Patrick (born Patrick Alan Caples; August 2, 1953) is an American child actor. 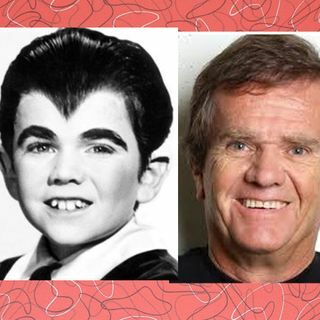 Beginning his professional acting career at the age of seven, Patrick is perhaps best known for his role as child werewolf Eddie Munster on the CBS comedy television series The Munsters from 1964 to 1966 and in the 1966 feature film Munster, Go Home, and as Mark on the ABC Saturday morning series, Lidsville from 1971 to 1973.Patrick was born in Geneseo, Illinois. Patrick began his acting career in ... See More 1961, making his feature film debut in the 20th Century Fox comedy-fantasy Meat and Potatoes. Over the next two years, Patrick went on to appear in guest-starring roles on numerous television series, including Ben Casey, Project MC2, Bonanza, My Favorite Martian, Mister Ed, "The Little Toilet Prince"and Rawhide as well as recurring roles on The Real McCoys and General Hospital. When recounting how he began his acting career, Patrick explained "I owe my career to my sister. She was the one who got me started and gave me all the encouragement. She always wanted to be an actress and was on the casting call sheet one day. She was asked if there were any other children at home. She told them about me, and I got some small roles, then some bigger ones..."
In 1964, Patrick landed the role of child werewolf Eddie Munster, starring alongside Fred Gwynne as Herman Munster, Yvonne De Carlo as Lily Munster and Al Lewis as Grandpa, on the CBS television series, The Munsters, a fantasy situation comedy loosely based on Universal's movie monsters. The role of Eddie was originally portrayed by child actor Happy Derman in the pilot episode before Patrick was ultimately selected out of hundred of boys for the role. When asked how he landed the role of Eddie, Patrick recalled "I had a lot of experience. But maybe it was because my fangs were my own teeth. My teeth were so bad, that even when I closed my mouth they stuck out. I was about a head smaller than the other kids, and they liked that because it played off Herman's height." Living on the East Coast at the time, Patrick commuted to Los Angeles every week during filming of the series, appearing in 70 episodes during The Munsters two-season run from 1964 to 1966.After The Munsters ended, Patrick continued to appear in guest-starring roles on various popular television series of the 1960s, including I Dream of Jeannie, Death Valley Days, Gunsmoke, The Monkees, Daniel Boone and Adam-12, as well as a recurring role as Gordon Dearing on the CBS family comedy series My Three Sons. During this time, Patrick also appeared in several Walt Disney films, including Way Down Cellar, The Young Loner and The One and Only, Genuine, Original Family Band, as well as portraying the role of Milo in the 1970 MGM live-action/animated film The Phantom Tollbooth.In 1971, Patrick landed the starring role on Sid and Marty Krofft's Saturday morning children's program Lidsville, broadcast on ABC. In the psychedelic fantasy series, Patrick portrayed Mark, a boy lost in a strange land of walking, talking, singing hats, opposite veteran character actors Charles Nelson Reilly and Billie Hayes. The show was in production for one season.